We would like to extend our gratitude to the speakers who graciously offered their time and expertise to the students of 2021 enrolled in the Conditions Influencing Occupational Performance course. Thank you to Dr. Susan Sobel, Dr. Jim Guinee, and Ms. Kayla Gowin for helping educate our students on mood disorders, schizophrenic disorders, anxiety, trauma, and obsessive-compulsive disorders. Our 2019 intramural basketball team recently competed against the team from the Physical Therapy Department…and won! 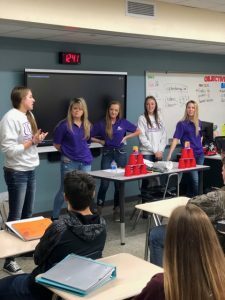 As part of the Professional Foundations course, students from the class of 2021 advocated at the legislative level by talking to different registered organizations on campus to compose letters of support for the Medicare Home Health Flexibility Act and letters of rejection for the PROSPER Act. In total the group sent 366 letters to 10 Senators and 12 Representatives in 5 states! 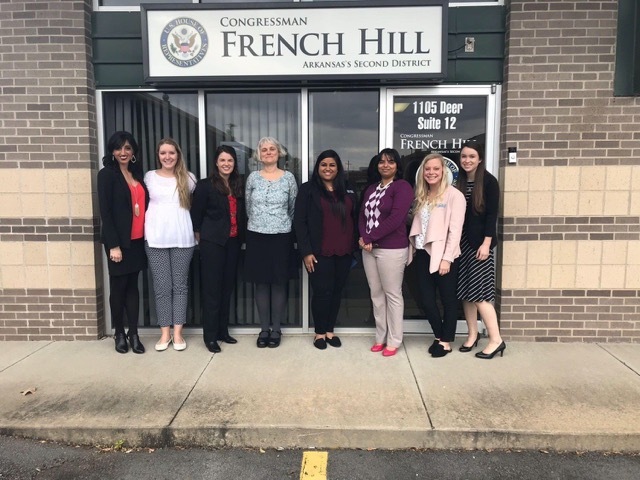 Additionally, students were also able to visit with staff members of Rep. French Hill’s office to explain how these acts will influence occupational therapy practice. 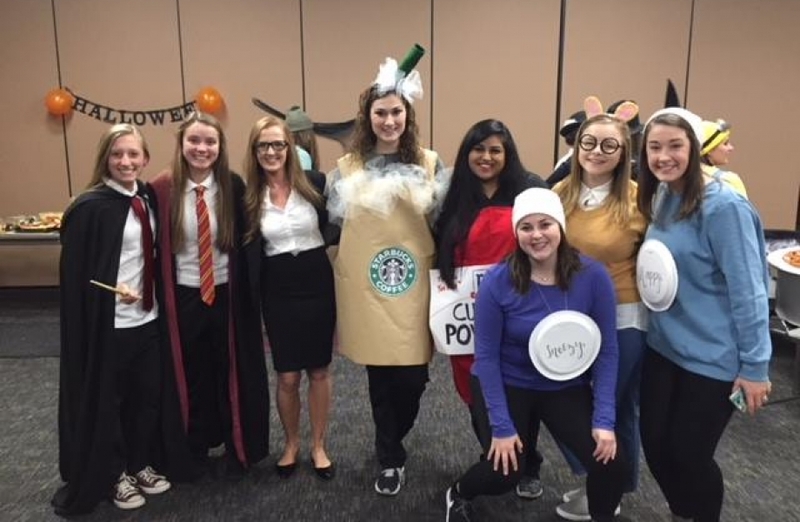 Students from the class of 2021 completed different advocacy projects throughout the Fall semester as part of the Professional Foundations course. 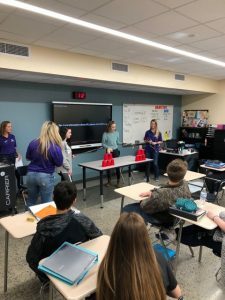 One group advocated by talking to high school students in Greenbrier about the distinct value of occupational therapy. 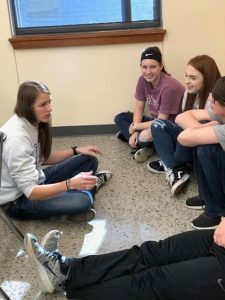 For the Research course in the Fall of 2018, students from the class of 2021 were able to interview authors in relation to articles recently published in the Journal of Applied Gerontology. Here is a link to some of the podcasts that were created based off their interviews! There are seventeen podcasts featuring our students. Awesome job! Traywick, L., Saviers, B., Graybeal, L, Atkins, K., Brown, A., Cain, D. (April 2019). Bears for CARE: A service-learning respite care model for preparing future professionals. Accepted for a professional poster presentation at the Gulf South Summit, Huntsville, TX. 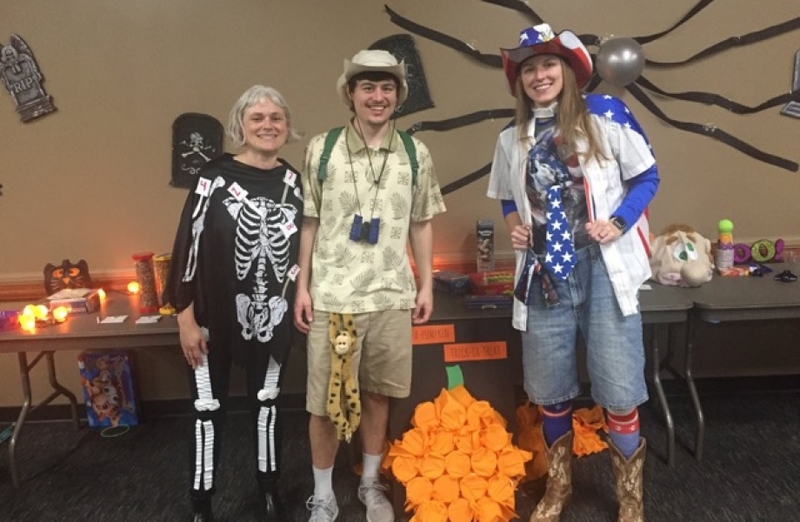 A BIG shout-out and congratulations to Whitney Harper (c/o 2020), who was published in this edition of the AOTA Student Spotlight in the online AOTA’s OT Student Pulse!! Whitney diligently worked on her manuscript during the Fall semester and it paid off! Way to represent UCA and Occupational Therapy, Whitney! Majeski, K., Hollenbeck, J., Berg, L., Spence, A., Mankey, T., Carroll, T., & Rudd, L. (2019). Evaluation of student preparation for postsecondary transition: An opportunity to demonstrate occupational therapy’s distinct value. Occupational Therapy Practice, American Occupational Therapy Association, Bethesda, Maryland. This article discusses the OT assessment process with transition age students under IDEA. Occupational therapy practitioners create a holistic view of the student that add value to the transition evaluation and planning process by using these occupation-based assessments Lastly, the article provides action steps assist OTs in transition assessment and planning. Trujillo, C., Mankey, T., & Carroll, T. (2019). State transition efforts: Advocacy in three states. Occupational Therapy Practice, American Occupational Therapy Association, Bethesda, Maryland. This article highlights how three members of the Transition CoP from three different states help to improve transition outcomes for students with disabilities. The advocacy story of each therapist in this article describes a different path, but they all share a common vision to improve occupational therapy in transition services within their own state. The article illustrates how occupational therapy practitioners can learn to improve transition within their own jurisdiction through local and state stories of advocacy and practice. Wishing the students from the class of 2020 all the best as they begin their Level II Fieldwork today! We look forward to seeing how you bridge the classroom to the clinic. Occupational Therapy student, Hayley Overbay, was commissioned as Second Lieutenant in the United States Army Reserves on Thursday, December 13th. She will graduate with a Master of Science in Occupational Therapy tonight, December 14th. We are so proud of you and your accomplishments. Dr. Lorrie George Paschal and colleague awarded! Congratulations Dr. Lorrie George-Paschal and Melissa Bowan (Baptist Health OT Faculty) for their Deliver Hope’s Dare to Dream Award for their commitment to mentoring adolescents in the Faulkner County Juvenile Drug Court. This award will be presented at the Deliver Hope’s Banquet on January, 26th, 2019. 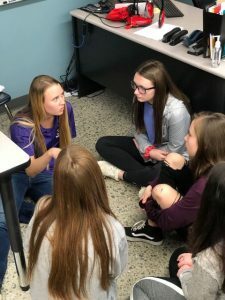 Students from the class of 2021 completed different advocacy projects throughout the semester. 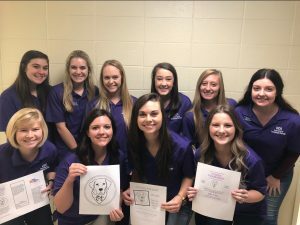 One group advocated for the AOTPAC Student Challenge by selling stickers of our favorite facility dog, Nibs! They sold stickers for $5 a piece and were able to inform undergraduate students, peers, practicing therapist, and faculty what AOTPAC is, why it is important, and how it will impact them one day in the future. Their goal was to raise $350 and they raised $445! On November 30th the department celebrated Nibs’ 7th birthday with a puppy paw-ty! Several of her friends (human and canine) were able to attend. Advocating at the Boys and Girls Club! 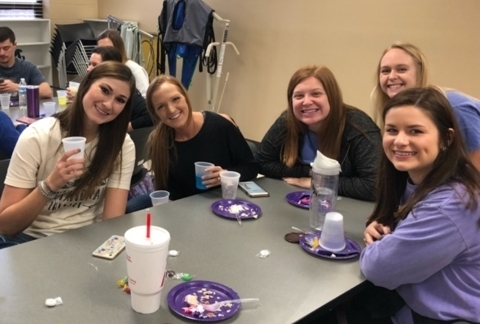 Way to go to these first-year students who advocated for occupational therapy at the local Boys & Girls Club as part of the Professional Foundations course! We appreciate the Club’s collaboration, the staff participation, and great questions! New Group of Certified Brain Injury Specialist! Dr. Veronica Rowe has been granted a sub-award as a co-investigator for a national, multi-center, clinical trial, “TRANScranial direct current stimulation for POst-stroke motor Recovery – a phase II study (TRANSPORT 2)” funded by the NIH StrokeNet Clinical Trials and Biomarker Studies for Stroke Treatment, Recovery, and Prevention (U01). She will be responsible for standardizing all evaluators and maintaining ongoing reliability for the Fugl-Meyer Upper Extremity (FM-UE), Wolf Motor Function Test, and the Stroke Impact Scale, and adjudicating all scores of the FM-UE as the primary outcome measure. Granted $104,075 sub-award from August 2018 through July 2022. 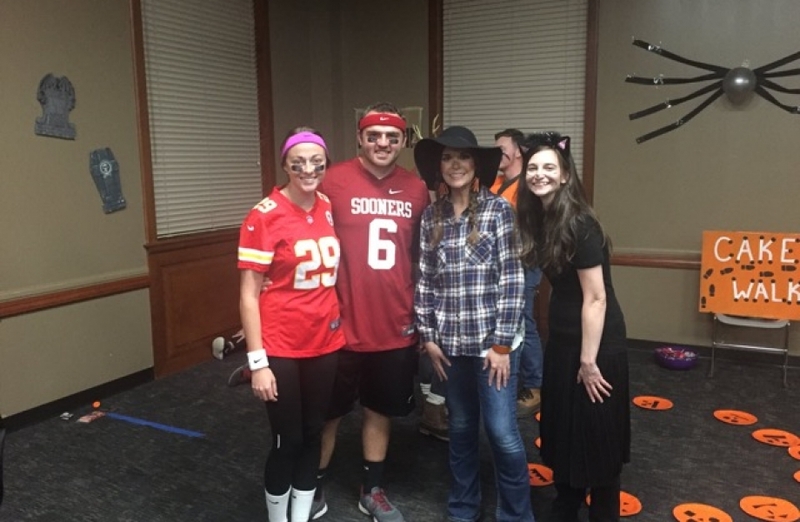 The Student Caucus for Diversity in Occupational Therapy and the Students for Pre-Occupational Therapy recently teamed up with athletes from the Special Olympics team to play a tournament of bocce ball! 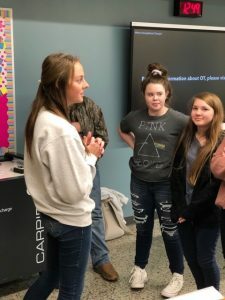 The department recently hosted students from Southside Bee Branch, Quitman, and Rosebud to educate them about the gross anatomy lab and advocate for occupational therapy as a profession. 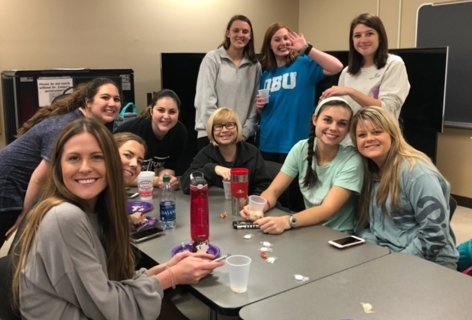 Congrats to the members of the Student Caucus for Diversity of Occupational Therapy on their inaugural event “Bridging the Gap: Advocating for Diversity in UCA’s Healthcare Programs.” This program consisted of a panel made up of underrepresented students currently enrolled in a healthcare program, as well as alumni from some of these programs. Individuals were able to come and ask questions about the specific program they were interested in. The panelist did a great job sharing their experiences and networking with other students. Thanks to the panelists and attendees for making this event a huge success! Students from the class of 2021 practiced using their therapeutic use of self in Art and Science lab recently! They were instructed to create either an adult or pediatric game, a craft, or a toy – each group had the same options to choose from. Proud of our student, Cadet Hayley Overbay, for honoring veterans while representing UCA Occupational Therapy. We have enjoyed watching Hayley grow into her niche of being an occupational therapy practitioner in the United States Army through ROTC! 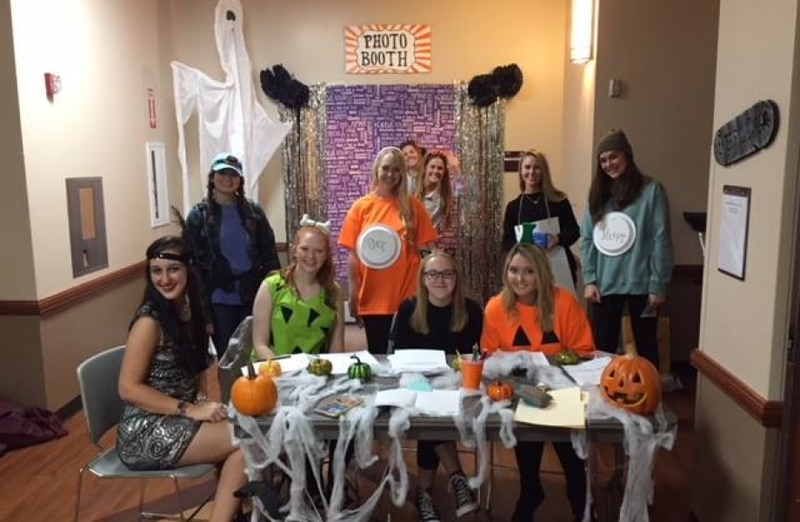 The class of 2021 recently co-hosted a Halloween Dance with students from the Department of Communication and Sciences Disorders for Independent Living Services in Conway! Multiple games were made available to a variety of skill levels and could be graded up or down depending on the challenge desired. 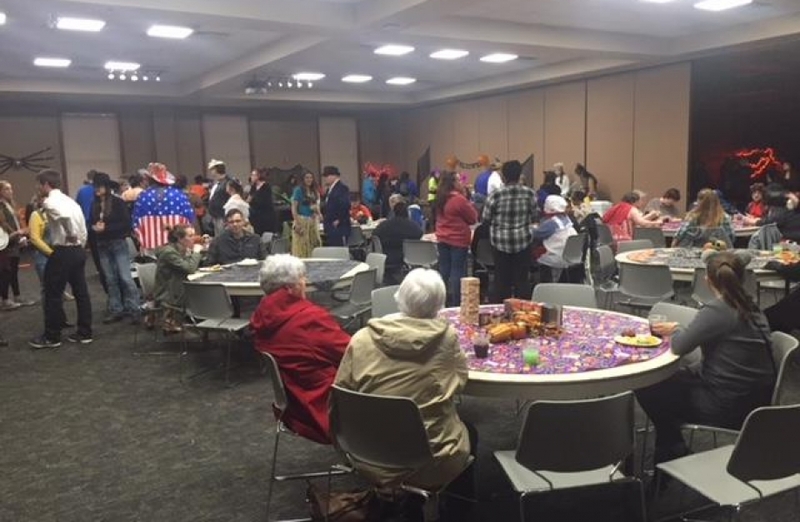 There were food and drinks, a spook-tacular DJ, and a costume contest. Quantum Rehab shared their expertise with our 2nd year students in their Holistic Interventions Adult to End-of-Life Course recently. They learned about holistic assistive technology from guest instructor and Quantum representative, Andy Campbell. ACTs Presents: Heroes: Is Google Wrong? “Hey now, you’re an all-star, get your game on get, get paid! 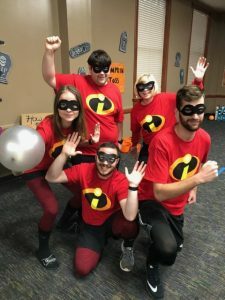 !” If you want a night full of free fun, head on over to Reynolds Performance Hall on November 7th to support your local super heroe s! 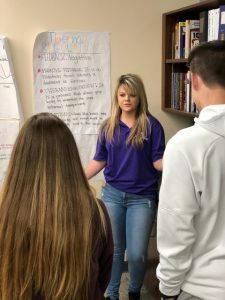 Mrs. Brittany Saviers was selected by the American Occupational Therapy Political Action Committee (AOTPAC) Board of Directors to serve as a member of the Circle of Advisors for the AOTPAC. Members of the Circle of Advisors share their talents in service to the mission of the AOTPAC by providing the organization with their professional expertise; their diverse knowledge of constituent perspectives; their connections to local, state, or national resources, colleagues or peers; and other forms of needed assistance. Dr. Veronica Rowe was selected and completed work as a research reviewer for the National Center for Injury Prevention and Control, Special Emphasis Panel, grant applications for Injury Control Research Centers. Sponsored by the Center for Disease Control and Prevention (CDC) in Atlanta, GA, Nov 1-2, 2018. Following the UCA OT Fall Conference on October 5th, we celebrated our Alumni with an After Party at Buffalo Alumni Hall! We were proud to honor the nominees and recipient of the Cynthia Cole Outstanding Fieldwork Educator Award for 2017-2018, who are nominated by our OT students. Nominees included Ashley Eldridge, James Saviers, Carrie Binns, and Elizabeth Cook. Congratulations to Mr. James Saviers with Arkansas Lymphedema & Physical Therapy Providers for being this years award recipient! We thank all of our fieldwork educators and alumni for their dedication to our students and program! We celebrated Dr. Jennifer Moore’s 25 years of service to the Department of Occupational Therapy and UCA, while also bidding her farewell. After 25 years as a faculty member and chairperson, Dr. Jennifer Moore announced her resignation from the Department of Occupational Therapy. She has accepted a position as the founding chair of the Occupational Therapy Program at Arkansas Colleges of Health Education in Fort Smith, Arkansas. Born and raised in the area with family who still live in the area, this opportunity allows her to continue her commitment to educating occupational therapy students and to spend more time with her family. Mr. Todd Parker from Parker Education & Development spoke to the class of 2021 on Monday, October 8 about civility and providing OT services to people from diverse backgrounds, cultures, and histories. Proud of these students who volunteered their time at the Arkansas Down Syndrome Association’s Annual Block Party! Students engaged over 150 attendees of all ages in football—themed games, crafts, face painting, pumpkin painting, bubbles, carousel rides, and more! 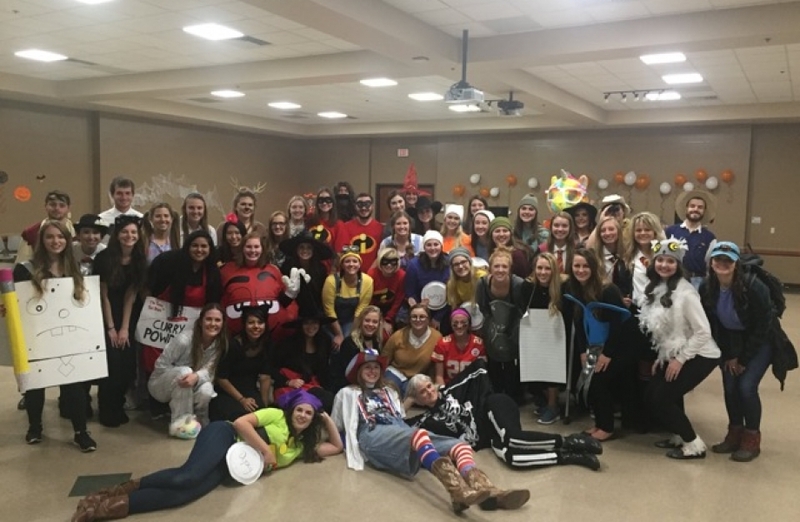 Check out all the fun from our Annual OT Fall Conference on October 5th! We are grateful to our lecturers Drs. Graham Rowles and Sue Baptiste, as well as the amazing speakers at our breakout sessions. We would like to extend our gratitude and thanks once again to our vendors and our sponsors – we couldn’t have done it without you. Olivia Brown tests out equipment from conference vendor: Village Health Services and Pharmacy. The Class of 2020 perfected their splinting skills in Holistic Intervention in Birth-Young Adult lab on Monday. A lot of fun & learning occurred with the hands-on experience of making Spasticity Ball Splint under the direction of Mr. Chris Ryan & Dr. Tina Mankey! Several students from the class of 2020 and 2021 spent their Saturday volunteering at the Conway Eco & Art Fest! 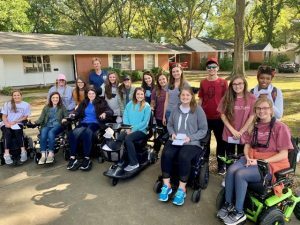 They helped participants have the most inclusive experience possible by offering golf cart rides to help with accessibility, hosting an accessibility tent, and hosting a children’s activity tent. Go Bears!